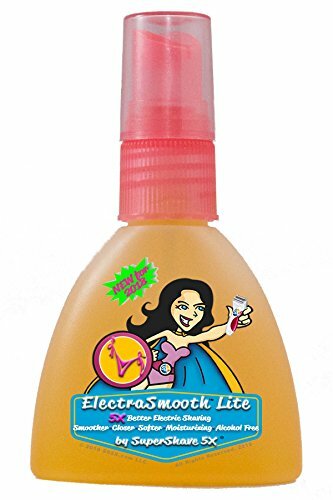 ElectraSmooth's 100% natural ingredients provide a smoother, closer and softer shave while nourishing and moisturizing skin. Its unsurpassed lubrication resists irritation even on the most sensitive skin. ElectraSmooth is formulated with: ALOE to heal irritations and moisturize skin; ROSEHIP OIL to treat signs of aging, pigmentation and repair damaged skin; WHEAT GERM OIL to deliver a healthy infusion of vitamins A, D, and B complex; & VITAMIN E OIL, a powerful fat-soluble antioxidant which is readily absorbed into the epidermis, to nourish and rejuvenate skin from within producing a lighter, softer, and more radiant skin while promoting regeneration of new skin cells. A user (DH 9/12/17) describes the experience, "Love your product. Much better than I have ever used. Even received a compliment where I get a facial: 'Your skin is much improved.' "
5X better electric shaving: Smoother, Closer, Softer, Moisturizing, Alcohol Free. Delivers a healthy infusion of antioxidants plus vitamins A, D, and B complex. Readily absorbed to nourish skin from within for improved skin texture and appearance. Unsurpassed lubrication resists irritation even on the most sensitive skin. Concentrated: A little goes a long way! Pleasant scent. If you have any questions about this product by SuperShave 5X, contact us by completing and submitting the form below. If you are looking for a specif part number, please include it with your message.